Link Building Game | Orange County SEO Company, Inc.
Link building is the process of creating links that lead back to your website and point potential customers where you would like them to go. Link building is a slow and gradual process, although it can be hastened by controlled work targeting specific markets or keywords. • Evaluate every link for value. The link builder with the most valuable collection wins! If a link is not valuable, do not spend your valuable time on it. Instead, focus on the links that will give you the most “bang for your buck.” In Monopoly, think about Boardwalk and Park Place. Someone who owns those two piece of property generally wins the game. • Follow the rules. 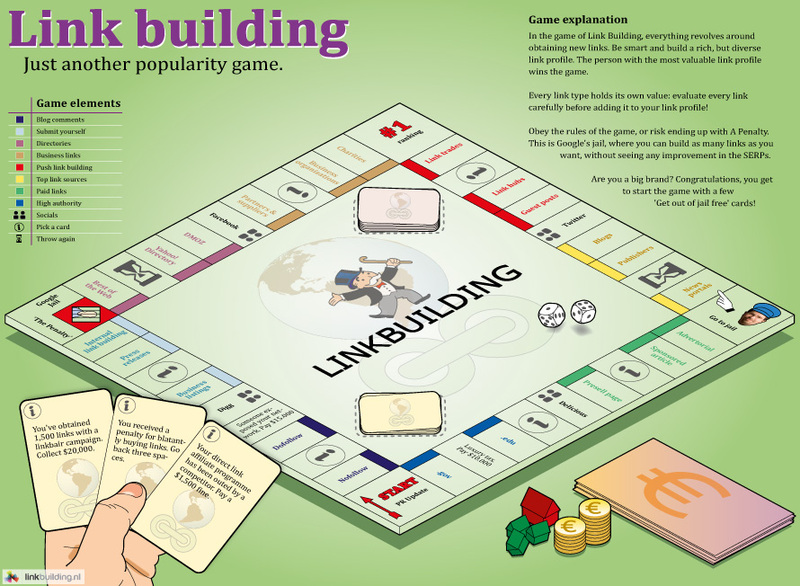 Those engaging in “bad” link building can end up in jail without passing Go or collecting any money! Not only is bad link building costly but it is also unethical. Be sure you play by the rules so that you do not end up costing yourself time, money and reputation with a link mess that gets you banned from the search engines. • Big brands may hold a “get out of jail free” card, but these are not unlimited. Even big players still have to follow the rules. For small businesses, it is vital that you continue your link building activities within the realm of ethical, moral and legal behavior. Search engines quickly punish those who engage in sketchy link building by pulling them from their search results. If you are pulled from Google, Bing or Yahoo for poor link-building activities, you will lose a large portion of your customer base, so it is important to keep your nose clean and follow the rules of good link building. Beware of companies that advertise link building strategies with instant results. By playing the link-building game, you can build a library of great links that will get your company noticed on the web! Link building is one of the single most important ways you can maximize your advertising budget and get the visitors to your site who will be viewing and buying your products. Think of link building as posting billboards on the internet to catch the attention of passing traffic. Just as a good billboard reaches drivers on the highway, your links grab the interest of drivers on the web. Orange County SEO can help you discover approved methods of link building that will give your company the boost it needs to make its Internet presence felt and draw customers to your website. Talk to us today about our proven link-building strategies and how we can help you boost your business through planned link building activities. If you are in need of internet marketing for you business, please contact Orange County SEO for a free quote today.